For more than a decade we have written a preview for the coming year and posted it for free on our website and each year more and more people eagerly await our annual preview. Read on for our take on what to expect for 2016! On February 8, 2016 we will celebrate the Lunar New Year, but in Chinese Metaphysics we will usher in Bing Shen 丙申 year on February 4, 2016 at 5:46pm. This year will be Bing Shen 丙申 year, which indicates an overall trend of natural disasters. Expect earthquakes and forest fires to cause problems for the coming year. This year is Chen hexagram, which symbolizes “the arousing” or “shock”. Despite fear, we must take action and move forward. As such, we must ask the tough question and do the hard task so that we can grow. Chen hexagram is Chen trigram over Chen trigram, thunder over thunder, so we should expect it to be a noisy year with more protests, arguments, and loud proclamation. There will also be more frightening events this year than past years. Transportation will be one of the top trending topics this year. High speed rail will become more accessible to a wider range of people with new lines gaining ridership and plans to install new lines and expand existing lines around the world. There will also be some significant strides in solar power and its possible application in transportation. We also expect Uber to expand its operations which will be met with resistance in some municipalities, making it a more widely discussed issue. Expect Uber to continue to gain popularity as more and more people participate in ride sharing. Another issue which people will be talking about is the way we work. More people will find alternative ways to make money, such as Uber, or different ways to get their work done, such as job sharing. In general, we expect the market to be down for 2016 with the hardest hit sectors being financials and commodities. Regardless of industry, investing in innovative companies will see the best returns this year. Also, non-traditional industries will be good buys. The price of oil will fall further but will start to see an upward trend around the middle of the year, with the end of summer being strong for oil prices. On the world stage, we will see growth in emerging markets in South America. For Asia, including China and India, we will see modest growth. In Western Europe, we expect more government intervention to help with struggling economies. In North America, the economy will be slightly up. With the American election coming up in 2016, we will see many heated debates over fundamental rights and ideological differences. This year, we will see very harsh divides between opposing sides in all things, not only politics. Race, immigration, and gun control will polarize the population even further. In the end, this is a great year to see the first woman president and therefore Hillary Clinton could have an edge. At the 2016 Olympics Brazil will shine on the world stage and China will be a strong force, likely leading in gold medal count. In the Middle East we expect the war to continue without resolution this year. Also expect more conflict in Eastern Europe. On a global scale, we will see more volatility in world affairs. Terrorism will continue to be a threat and the refugee situation will continue to escalate. Terrorist attacks are possible in Eastern Europe this year. In addition, there is a high chance of another global health epidemic this year. This illness will be related to the respiratory system and/or the digestive system. With the change in period coming up expect more instability over the course of the year into next year. For those born in the Year of the Rat (1948, 1960, 1972, 1984), any lingering problems you had in previous years will be resolved this year. This is true of financial and career problems but even more so for relationship problems. Overall, this will be a good year for you. Work will be good and if you have been considering starting a new business, this is the year to do it. The only problem to watch out for is all this prosperity will have you out and about more and could cause unwanted weight gain. For those born in the Year of the Ox (1949, 1961, 1973, 1985), this year will be lighter and easier for you. In your career you will have the support of others. Your wealth luck will be better. Although your regular income will be good your lucky money will be mediocre at best so try not to make any big gambles. This year your money will be depleted so try to find something you want to buy or invest in and put your money there rather than it getting spent for you. For those born in the Year of the Tiger (1950, 1962, 1974, 1986), this year will not be very smooth. You will feel as though you are a victim of circumstances beyond your control. You will also be prone to making the wrong decision so make sure you carefully consider all options before making any major decision. Luckily, you will have helpful people to aid you, but they will not appear right away so you will have to be patient. Since this will not be a great year for you, try not to make any major moves. Try to stay put for this year and do not change jobs unnecessarily. For those born in the Year of the Rabbit (1951, 1963, 1975, 1987), this year will be good and bad; a year of half-and-half. You will meet someone this year that could drag you into a love triangle. If you do get involved in a love triangle it will take two to three years to resolve so it is best to try to avoid it. If you feel something starting to happen, talk to your friends about it. They will have good advice on this situation. On the positive side, your career will be good this year so it is best to concentrate your energies on work instead of distractions. You have a good chance of getting a promotion or a raise. For those born in the Year of the Dragon (1952, 1964, 1976, 1988), overall this year will not be too bad for you. You will finally see the light at the end of the tunnel. Money-wise, this will not be a shabby year. It will not be great, but you will still be happy with what you get. Your health may have some minor ailments or injuries. Make sure to take the time to take care of your health problems properly or it will go on to bother you in coming years. Your relationship will be very steady and smooth without many arguments or much excitement. For those born in the Year of the Snake (1953, 1965, 1977, 1989), this year will be better than the last but you will have to be careful because there is gossiping going on around you. At work, because of the gossip, try to work more and talk less to avoid problems. You do still need to communicate with your co-workers and superiors but do not get involved in unnecessary conversations. Doing this may help you get the raise you have been after. This year you will envision many varied goals and will begin to make plans but you may find some of those plans will get abruptly stopped. For couples, try to spend more time together. For those born in the Year of the Horse (1954, 1966, 1978, 1990), this year will not be bad at all. You will have helpful people around you and it is a good time to grab your chance. You will start to take action on plans made in previous years. Wealth-wise, you will find that everything is going well. You can even make investments to make some extra income on the side. Just be careful not to get too greedy. In general, your health will be fine but if you are travelling beware of digestive ailments. For those born in the Year of the Sheep (1955, 1967, 1979, 1991), this year it is better to stay put rather than make drastic changes. Your charisma will be exceptional this year so try to capitalize on that. Health-wise, you will be more prone to digestive ailments than usual. With your wealth, you can do some small investments but make sure you diversify your investments. If you are single, you may meet someone you will like this year but try not to come on too strong or you will scare them away. For those born in the Year of the Monkey (1956, 1968, 1980, 1992), this year will be a little difficult. Do not rush into anything or any decisions this year. Make sure you take the time to think through the issue completely. If not, you will lose more than expected or hurt yourself in the process. This year you will be more forgetful than usual and will be prone to misplacing objects. It is nothing life threatening and as long as you take care and be more mindful everything will be fine. For those born in the Year of the Rooster (1957, 1969, 1981, 1993), this year will be fairly stable for you. You will have helpful people around you. You do have to be aware that something will look appealing to you but upon further inspection you will find that it is was only in your mind. In actuality, it will not be especially good. This applies to work and love. For those born in the Year of the Dog (1958, 1970, 1982, 1994), this year you will have bad stars around you that will affect your moods. Expect your temperament to be more unstable that usual. Because of this you have to find the middle ground and try not to jump into anything rashly but also try not to overthink issues either. When it comes to love, if you are single you could meet someone but the relationship will be surrounded by gossip. If you are married you could have more arguments with your spouse than normal. Pay more attention to your elders this year. For those born in the Year of the Pig (1959, 1971, 1983, 1995), this will not be a bad year for you but there will still be gossip around you. With your career, try not to rely on others; they will not be able to help you. You will have to do the task yourself or make the decision on your own. Your lucky money is good this year. Your love life will be stable this year although female Pigs will have a slightly more complicated love life than male Pigs. The Annual Flying Star Chart will have 2 in the center. The San Sha will move to the south. This year, the most dangerous area will be south because of the San Sha. It is important that we deal with the San Sha adequately. We provide a list of cures below that are low cost and easily procured, so please make sure that they are in place for 2016. 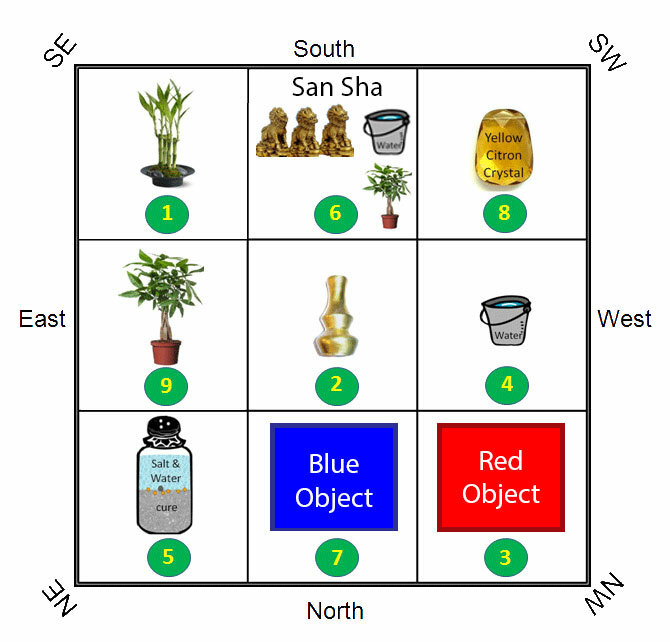 To minimize the effect of the San Sha place 3 ki luns, a small bucket of water and a live plant in the SOUTH. Putting 4 stalks of Chinese lucky bamboo in the SOUTHEAST can enhance the possibility of career advancement, improved academic studies or heightened romance. To minimize the Annual 2 Black to avoid illness, simply place a metal calabash in the CENTER of the house. To combat the 5 Yellow place the salt-water and coins cure in the NORTHEAST of your home. Place something blue in the NORTH to lessen the effect of the Annual 7. The SOUTHWEST will be the best sector in 2016. Simply put a citron crystal there for a better year financially. Put a plant in the EAST to bring about events for celebration. Need help placing the cures for 2016? Want a personalized month-by-month bazi reading for 2016? Click here to learn more. Click here to find out more about our ever popular annual services. Wishing you all the best in Bing Shen Year! *We launched this article with a free online talk. Click here to watch the recording.